If you prepare in advance, a little at a time, it is worth it. You can have the prepared filling and pastry in the fridge and, when ready, just assemble, bake and eat it. I love the idea of downsizing the traditional meat pies, to have individual portions, so that everyone gets enough pastry. I tried it out at home, using a standard muffin tin. (Go even smaller to a mini-muffin tin for some seriously fantastic party food). 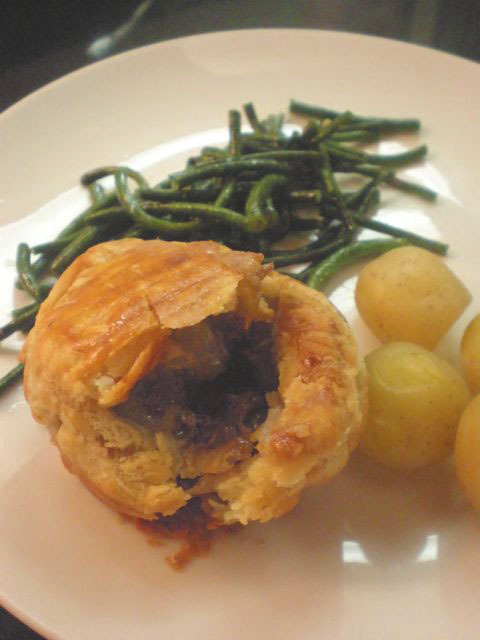 Here is a basic meat pie recipe, but the flexibility of your fillings is endless, as seen above, in the variations of flavors within each culture. I have been meaning to try an empanada recipe as well as a classic samosa one, so those will come in the next few entries. If you're going meatless, here is a Brie, Portobello and Kale Pie recipe that is substantially delicious. Want to make your own pastry? Do this before you prepare the filling. Combine flour and salt In a shallow bowl, add the meat cubes and toss to coat evenly. Coat the bottom of a heavy-based pot with a bit of oil. On medium-high heat, sauté the onion, celery and carrot for 5 minutes, until the onion is translucent. Scoop out and set aside in a large bowl. Add more oil, and on high heat, fry the meat so it's browned on all sides (about 1-2 minutes per side). Scoop out and set aside, on top of the cooked veggies. Pour a small amount of the water-vinegar into the pot so it will bubble up quickly. Use this to help scrape up any bits stuck to the pan (de-glaze). Put the cooked onion-celery-carrot and meat back into the pot. Pour in remaining water. Bring to a boil, then turn heat down, cover and simmer (make sure that it is gently bubbling) for an hour, stirring occasionally. On a lightly-floured surface, roll the pastry out slightly and using a 4.5" (11cm) diameter inverted bowl, to help mark out and cut out 8 rounds. Press these pastry discs down into the muffin tin cups with a bit of pastry sticking up from the sides. Roll out smaller 3" (8cm) for the tops and set aside. Fill up with a 1-2 heaped spoonfuls of the filling. Brush the edges of pastry that are sticking up with the egg. Place the top on and pinch the all the edges together to create and even seal. Using a sharp knife, cut a small cross in the center to allow steam to escape when baking. Continue to assemble all the rest. Brush the egg wash on all the tops and bake for 20 minutes until the pastry is golden brown. I LOVE the name Tuck Shop for an Aussie cafe abroad (its the name of school cafeterias down under where meat pies and sausage rolls were the staple treats) And will def make this recipe for Siennas parties. Love it!